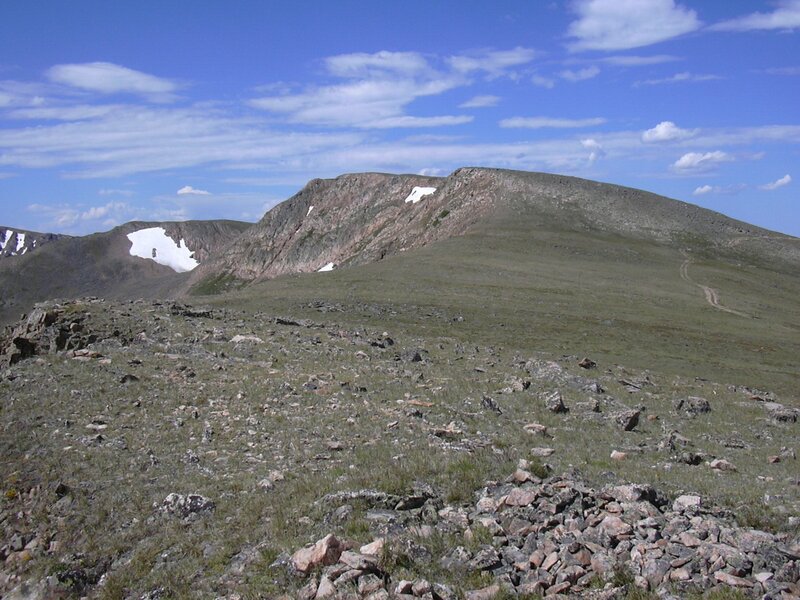 The high point of this hike is Gilpin-Grand-Boulder Peak which is at the intersection of those three counties. That's the name we use for this peak. Officially it's unnamed, and isn't on Roach's Boulder County Peaks List. One peak on this loop, Guinn Mountain (11,220'), is on Roach's list. This hike has two major parts. The hike of solitude and ruggedness from Lost Lake to Rollins Pass. And the well traveled and crowded (in the summer) hike from Rollins Pass back to the Hessie Trailhead. Parking on the side of the gravel road, near the Hessie Trailhead, we started hiking at 7:49, and took the King Lake Trail to its intersection with the Lost Lake Trail. There, we turned left at 8:25 onto the Lost Lake Trail, with the odometer showing 1.69 miles. Getting to Lost Lake at 8:32, the odometer showed 2.04 miles. We went around the north side of the lake and left the trail near its northwest corner. Heading southwest up a steep slope, we made a beeline for Point 10530. We reached Point 10530 at 9:09, where there is an old cabin. Being wooded, there is no view from this point. We then headed for Point 10918 geting there at 9:33, with the odometer at 3.4 miles. Continuing west along the ridge of Point 10918, we reached a natural gas pipeline at about 3.75 miles. There is a mountain bike trail over this pipeline, which we followed to the summit of Guinn Mountain. We reached the summit of Guinn Mtn at 10:11, with the odometer at 4.85 miles. Guinn Mountain has a broad summit with a beautiful alpine meadow and some trees. From Guinn summit, we headed west, where we could look down and see Yankee Doodle Lake just below us. Continuing west, we reached Rollins Pass Road at 10:33 with the odometer at 5.48 miles. Hiking along Rollins Pass Road for a minute or two, we soon left it, and headed up the ridge to Point 11829, getting there at 10:49 with the odometer at 6.15 miles. From Point 11829, we continued southwest up the ridge to Gilpin-Grand-Boulder Peak, reaching its summit at 11:09, with the odometer at 6.85 miles. There is no register on the summit. Bob and Betty Lakes, Jenny Lake, Rollins Pass, and Mt Epworth are just some of the things you can see from this summit. We left the summit at 11:24, and headed west down to Rollins Pass and Corona. From Corona, we followed the Continental Divide northwest to the King Lake Trail, then descended down to the lake, with the odometer at 8.27 miles. Enjoying lunch at King Lake, we began our return along the King Lake Trail at 12:34. We returned to our parking place at 15:07, with the final odometer reading at 14.6 miles. The total trip time was 7 hrs, 18 minutes, with an elevation difference from lowest to highest of 3,094 feet.